When we go somewhere we usually have an idea of why we are going and what we expect to find. Then, when we least expect it, we find something so different that it is disorienting. That is what happened in Tucson last week. 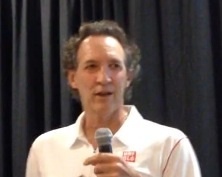 While at Tennis Congress USA a couple of weeks ago I was giving a presentation “Storytelling: A World Champion’s Secret to Playing the Best Game of Your Life” and was pleased to see Jeff Greenwald in attendance. He is a former #1 in the World 35 and 45 and over player and a top San Francisco based sports psychologist. Just back from The US Tennis Congress, a remarkable weekend in Atlanta, attended by over 200 recreational players all wanting to grow their games. Eager for information these players were welcomed by 60 of the most passionate informed tennis coaches in the World.